The threads of an experience often unusual. The seemingly disconnected ultimately connect. Before Thanksgiving, I did some of my grocery shopping at Albertson’s. It is not my usual grocer, but I can use gift cards we get through the SCRIP program for school. While in the store, I saw some Ball jars that were unusual and quite pretty. I resisted buying them because I knew I didn’t really have plans to can anything. I like to can, to make jam and preserves. I tucked away this fact, knowing I could come back later and get some of these jars. My regular grocer doesn’t carry Ball jars except during summer. They consider them seasonal. Whatever. About a week ago I had a craving for the hot mustard sauce that goes with my spinach balls. It is a hot, sweet mustard I only make at Thanksgiving, but the recipe makes only enough for Thanksgiving and left overs. I thought I would make some, and can it. Thus, I needed those pretty jars. Then my neighbors, both across the street and behind me, gave us oranges. The Satsumas are really tangerines. Â They peel easily and are as sweet as you could ever imagine. Cracking the peel releases an intense aroma of oranges. So now I have a stack of pretty Ball jars, one filled with the hot mustard sauce and the others beckoning for orange marmalade. So, I went looking for a proper marmalade recipe. I collect cookbooks, so looking through them can be a worm hole. I have a large tome dedicated just to Stocking Up. All about canning and preserving. Then I found a small book by Debby Bull, called Blue Jelly. It did not have a marmalade recipe but rather it struck me as an early predecessor to the blog. Published in 1997, it is lovely. I read it while drinking my coffe. I didn’t find a marmalade recipe, but I did find a sweet lesson about finding closure. How do you put away that which needs finishing. With canning, you are usually faced with an abundance of something, that unless you can find a use for it, will spoil. Fruit ripens, vegetables wilt and wither, all eventually rotting and useless. Canning allows you to put it up, saving it for another day, a different season. Summer’s cucumbers pickled and servedÂ in December. Summer’s blueberries on fresh bread in winter. 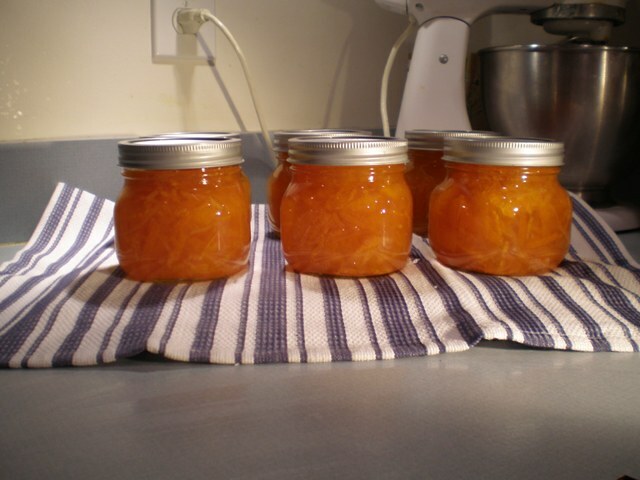 Winter oranges, boiled and sliced and turned to gemlike marmalade for summer sandwiches. So as this year, 2007, comes to an end,Â I put it away.Â I let it sit. It needs time. I know it has been a difficult year for me personally, but at the same time very rewarding. I was tested this year in ways not previously tested. I am still learning, but I learned much. I haveÂ rotated upÂ to the next cog and the machine has not chewed me up yet. There was a alot of change this year. The seasons were harsh and distinct and I feel confident, I weathered them well. I do have the signs of wear, though. That is what gives me character, right? Later, I think I will be able to take this year down and savor it for its abundance and be grateful of its bounty.